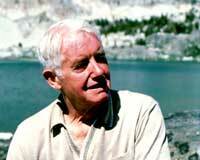 Twice nominated for the Nobel Peace Prize, described as "a visionary ahead of his time," David Brower successfully fought to keep dams out of the Grand Canyon, led victorious campaigns to save Washington's North Cascades Wilderness and the California redwoods, and spearheaded fights against nuclear power and the Alaska pipeline. This inspiring profile is filled with footage of some of the most spectacular wilderness areas in the United States, and with excerpts from Brower's home movies and the pioneering environmental documentaries which he made for the Sierra Club. David Brower is a prime example of the difference a dedicated individual can make in the American political landscape. Other films by John de Graaf are AFFLUENZA, ESCAPE FROM AFFLUENZA, BUYER BE FAIR, SILENT KILLER: The Unfinished Campaign against Hunger, THE MOTHERHOOD MANIFESTO, BEYOND ORGANIC, ON NATURE'S TERMS, HOT POTATOES, DAVID BROWER: A Conversation with Scott Simon, and WHAT'S THE ECONOMY FOR, ANYWAY?. "David Brower is that rarest of individuals, a prophet whose prophecy is being listened to in his own time. His life instructs and inspires. Every person concerned about the future of this planet must see this program!" "This well-balanced profile of the septuagenarian maverick chronologically details his many accomplishments...Personalizing the conservation movement."